Pharmac India , 5th – 7th September 2013, Hitex Exhibition Complex, Hyderabad, India. CPhi India , 3rd – 5th December 2013, Bombay Exhibiton Center, Goregaon, Mumbai, India. 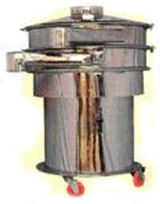 Vibro Sifter find application in Separation of solids from solids/ liquid & grading of materials as per product mesh size. The range of Vibro Sifters that we offer are of high pharmaceutical finish made to cGMP Constriction. Sizes available in 12”, 20", 30", 36", & 48"
High degree of pharmaceutical finish. Double Decker arrangement can be provided. Design by Vision Websters Pvt.Ltd.